Welcome to the world, pasty pins! Finally the sun has decided to grace us with its warmth, so it's acceptable to whack out the white legs and attempt to get a tan (or in my case, sunburn after five minutes...). 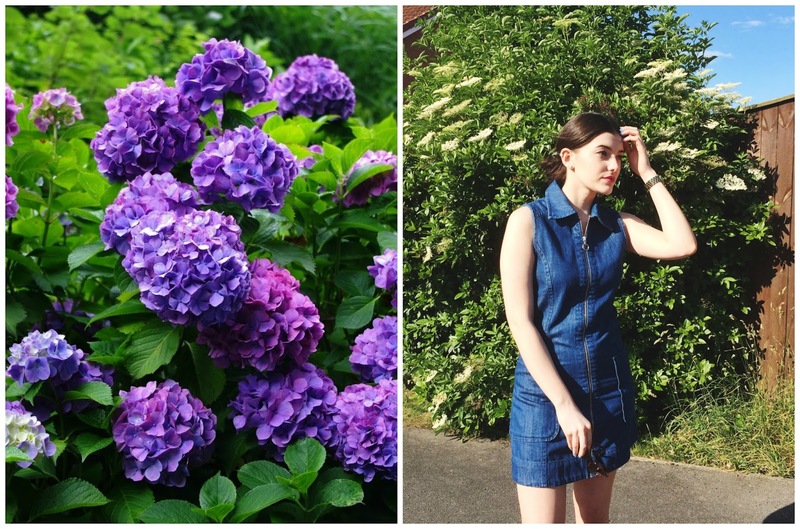 Not only this, but I finally got the chance to wear my new denim dress (how dreamy?! ); A-Line, patch pockets, collar detailing, and zip front - the combination for the ultimate denim dress. Let me just quickly mention my beautiful new shoes, too! After seeing the fabulous Megan over at PagesByMegan rock them with some frayed denim, I decided to give them a whirl with this dress, and they work a dream! Pink and holographic, aka the most perfect shoes ever??? I can't wait to wear them out more in the summer, they look just amazing when the sun catches them. I must say, this is one of my fave outfit combos to date. Those shoes are such a gem! Love the cute little block heel! I'm loving your denim dress, as well as those holo pink block shoes- they both go really well together!